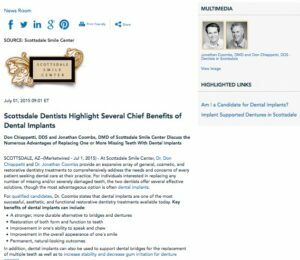 Don Chiappetti, DDS and Jonathan Coombs, DMD of Scottsdale Smile Center discuss the numerous advantages of replacing one or more missing teeth with dental implants. Scottsdale, AZ — At Scottsdale Smile Center, Dr. Don Chiappetti and Dr. Jonathan Coombs provide an expansive array of general, cosmetic, and restorative dentistry treatments to comprehensively address the needs and concerns of every patient seeking dental care at their practice. For individuals interested in replacing any number of missing and/or severely damaged teeth, the two dentists offer several effective solutions, though the most advantageous option is often dental implants. In addition, dental implants can also be used to support dental bridges for the replacement of multiple teeth as well as to increase stability and decrease gum irritation for denture wearers. Thanks to revolutionary Cone Beam X-Ray technology and computer guided surgery, Dr. Chiappetti notes that dental implant surgery can now be performed more successfully than ever. Though there is no guarantee implants will properly fuse to the patient’s jawbone, he says studies show a success rate of 95% for lower jaw implants and 90% for upper jaw implants five years after their implantation. After earning his Bachelor of Arts degree from the University of Arizona, Dr. Chiappetti obtained his Doctorate of Dental Surgery from the esteemed University of Southern California. To further his education, he remains active in a number of renowned dental organizations, including the Academy of General Dentistry, the American Dental Association, and the Central Arizona Dental Society, among others. Outside of the office, Dr. Chiappetti lends his skills and expertise to humanitarian efforts such as Give Back a Smile and Christina Smile. After earning his dental degree from the University of Louisville, Dr. Coombs went on to complete hundreds of hours of continuing education, eventually earning the prestigious “Fellowship” status with the Academy of General Dentistry – an honor obtained by only three percent of all dentists. In addition, he maintains active membership in the American Academy of Implant Dentistry, the American Academy of Cosmetic Dentistry, the American Dental Association, and several other dental organizations. Dr. Coombs also gives back to the community by volunteering with Give Back a Smile and Christina Smile. Dr. Chiappetti and Dr. Coombs are available for interview upon request.